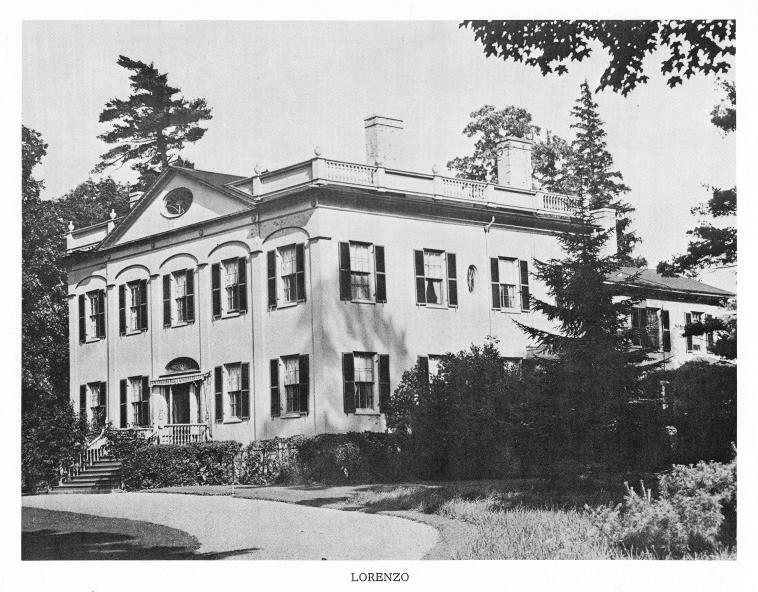 Abstract: Correspondence, legal documents, financial records, and memorabilia concerning the Holland Land Company, Colonel John Lincklaen, Jonathan Denise Ledyard, Helen Ledyard Lincklaen, Jane Strawbridge Ledyard, other Ledyard and Lincklaen family members, and Lorenzo mansion in Cazenovia. Photocopies and microfilm only, no originals. In 1792, Colonel John Lincklaen, who was an agent for the Holland Land Company, came to central New York to see some of the company tracts of land. The present township of Cazenovia was included in that particular tract of land. Colonel Lincklaen made a temporary encampment at the foot of Cazenovia Lake and fell in love with the surrounding woods and valleys. A village was founded by Lincklaen on this spot and in 1807 he built the distinguished federal mansion pictured on the following page. He and his wife, the former Helen Ledyard of Aurora, had no children, but they adopted Mrs. Lincklaen's brother, Jonathan Denise Ledyard and made him their heir. After the death of Colonel Lincklaen, Jonathan Ledyard took over the management of the Holland Land Company's affairs and eventually purchased their interests and property. Jonathan married Miss Jane Strawbridge of Philadelphia and their eldest son was named Lincklaen Ledyard. In an attempt to perpetuate the name of the family benefactor, he had his name legally reversed to Ledyard Lincklaen, but his only child was a daughter, Helen Lincklaen, who married Charles S. Fairchild, the secretary of the treasury under President Grover Cleveland. On the death of Mrs. Fairchild in 1931, Lorenzo was willed to her cousin, Mrs. Eliphalet Remington who died in 1953, leaving it to her brother, George S. Ledyard, the present occupant with his son, John Ledyard. Note: Note: This collection consists entirely of photopies and microfilm. It contains no originals. Lorenzo has remained in the possession of the Lincklaen/Ledyard family to the present day. Each generation of occupants used the various offices, vaults, files, and particularly attics for storage of family possessions and records. The documents enumerated in the Lorenzo Collection are the sum total of what has been preserved in Lorenzo since 1807 and represent almost two hundred years of family history. Quite naturally the thoughts and actions of the individuals characterize the preserved documents, but in an unusual fashion, the mansion Lorenzo has added its own peculiar stamp to the letters, diaries, and ledgers. Lorenzo has been the symbol of the family, its focal point, and its essence. All of the papers are related to it in one way or another and could be used by the diligent historian to fashion a "social, cultural, political, and economic history of Lorenzo in Cazenovia." As a recognition of its importance, Lorenzo has been honored by having the collection of documents named for it. The collection is divided into thirteen series. Holland Land Company Records contains company papers and the papers of four individuals: Theophile Cazenove, Arthur Cazenove, J. M. and Raoul de Cazenove. John and Helen Lincklaen contains land, legal, and business papers as well as correspondence for John Linklaen and his wife, Helen Ledyard Linklaen. John D. and Jane S. Ledyard contains the personal and business papers of John Denise Ledyard and his wife, Jane Strawbridge Ledyard. Also of interest are a few items of correspondence from Gerrit Smith, Samuel Morse, and Henry Ten Eyck. The Sons of John D. Ledyard contains the personal and business papers of the four sons of Jonathan Denise Ledyard and their wives, namely: Lincklaen Ledyard and his wife Helen Seymour Ledyard; George Strawbridge Ledyard and his wife Anne Smith Ledyard; Fitzhugh Ledyard; and Lambertus Wolters Ledyard. The Children of George S. Ledyard contains personal and business papers for Geroge Strawbridge Ledyard's three sons and one daughter, namely: John Denise Ledyard, Richard Fitzhugh Ledyard, Mary Fitzhugh Ledyard, and George S. Ledyard, Jr.
Samuel and Glen Ledyard contains the personal and business papers of John D. Ledyard's brother Samuel, and Samuel's son Glen Cuyler Ledyard. M. R. Ledyard, Murray Ledyard contains both personal and business papers for these two men. Allied and associated families includes personal and business papers of members of families related to or associated with the main Lorenzo family. Surnames represented are Breeze, Childs, Fairchild, Fitzhugh, Forman, Freneau, Krumbhaar, Remington, Seymour, Stebbins, Strawbridge, and Wolters. Genealogies contains genealogies of various Lorenzo families. Surnames represented include Ledyard, Forman, Strawbridge, Gilpin, and Parker. The Strawbridge genealogy goes back to the 13th century. There is also research material on the name "Ledyard." Ledyard miscellanea includes a cookbook, inventories, land surveys, and assorted other material from Ledyard family members. Miscellaneous papers consists of assorted land and financial papers (bills, receipts, ledgers, title abstracts, land surveys, etc). Included here is a history of Cazenovia and documents relating to the Cherry Valley Turnpike. Microfilm materials include personal diaries, travel accounts, letterbooks, farm ledgers, office diaries, and Holland Land Company records. This microfilming and photocopying project was sponsored by Syracuse University Library in cooperation with the late Dr. Albert B. Corey and the Division of Archives and History of the University of the State of New York. We regret that Dr. Corey did not live to see completion of this venture in which he was deeply concerned. Above all, a special note of thanks is extended for the generosity and courtesy of Messrs. George S. and John Ledyard. They permitted copying of these historically valuable papers and assisted in the sorting and identification of the documents. This finding aid could not have been constructed without their helpful advice, and the scholarly world is deeply in their debt. All series except microfilm are arranged alphabetically. Copies courtesy of Messrs. George S. Ledyard and John Ledyard.